Robert Taylor portrays American officer Captain Brad Parker on the front lines of the massive Allied landing, whose special commando unit must destroy a key German gun position. But for Captain Parker, the mission is also fraught with personal complications because he and his commander Colonel John Wynter (Richard Todd) are in love with the same woman Valerie Russell (Dana Wynter). 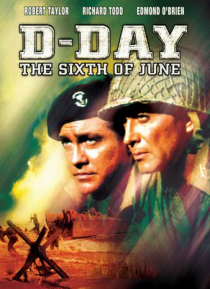 Featuring Edmon… d O'Brien as Colonel Axel Timmer and building to a stirring climax on the beaches of Normandy, D-DAY: THE SIXTH OF JUNE is a moving story of courage and sacrifice both on and off the battlefield.